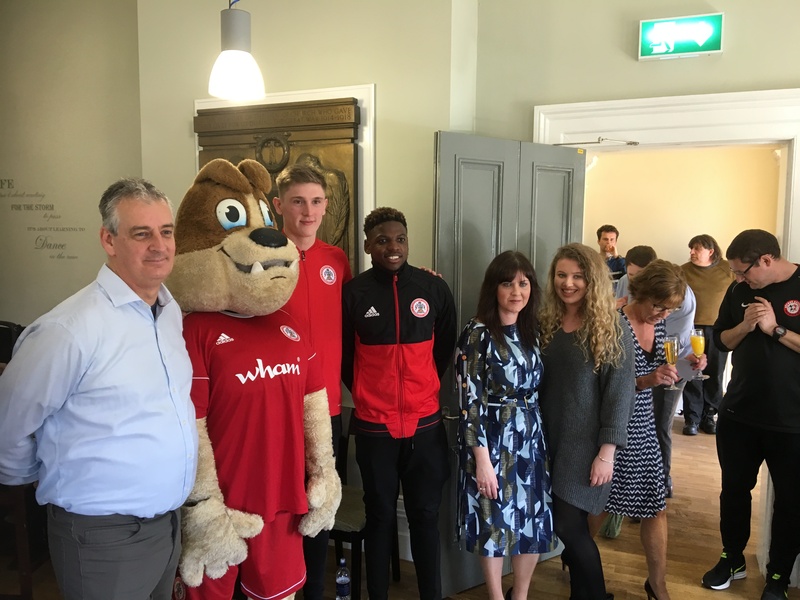 Accrington Stanley players Jimmy Dunne and Offrande Zanzala took time out this afternoon to help Community Solutions North West (CSNW) launch their new Chatty Café scheme. The scheme involves having a ‘Chatter & Natter’ table in their café at Elmfield Hall, Gatty Park. A Chatter & Natter table creates a space for people to talk; whether it’s for five minutes while you drink a brew, or an hour of good conversation. We’re not trying to build friendships – just simple interactions to combat loneliness and to just maybe have a big impact on someone’s day. Jimmy & Offrande cut the ribbon on the table and spoke to staff and volunteers. Along with Winstanley they also stayed around for a chatter & natter themselves. Defender Jimmy Dunne explained ‘it’s a great idea to have somewhere where local people who might feel a bit isolated and lonely to come and have some company without feeling nervous or intimidated’ Zanzala added ‘It’s great for us as players to get out and meet the community, Accrington Stanley is a real community club and supporting things like this is all part of engaging with the local people’. This project is the latest addition to the CSNW list of local initiatives and Accrington Stanley where more than happy to show their support. CSNW is an innovative social enterprise, specialising in engagement and support. Through holistic provision of bespoke solutions, we are committed to offering hope and opportunity to local people through social, health, economic and personal development. Our services are Lancashire wide. With a Solutions Focused Asset Based Approach (endorsed by UCLAN Evaluation – June 2014) our services and programmes recognise strengths and resilience rather than focusing on need. Accrington Stanley Community Trust would like to thanks Jimmy and Offrande for getting involved.